On wednesday the 6th of December we will already have the last edition of Quiet is the new loud before the winter break! As usual, the tunes will be played in De Bblthk in Wageningen, and entry will be free. Doors will be open at 20:30, so be on time to get the best seats and drinks! 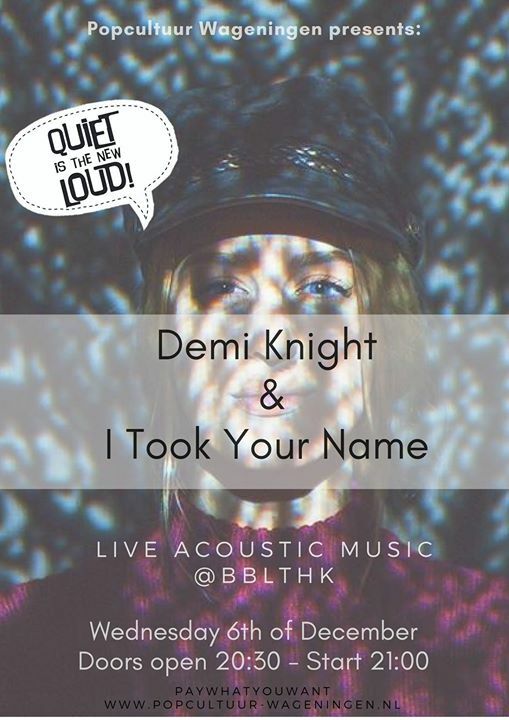 The performances will start at 21:00, and for this month’s musical masterpiece we will have performances by Demi Knight and I Took Your Name. Don’t forget to share the joy by inviting your friends and sharing the event. Demi Knight grew up listening to Dolly Parton and Loretta Lynn. Her participation in national tv-show ‘De Beste Singer/Songwriter van Nederland’ showed the world that she possesses the same countrysound and mature voice. After this, the ball started rolling for Knight.